A few years ago, in the Batman comic books, after the caped crusader was presumed dead, Jim Gordon helped protect Gotham using a giant Batman mechanized suit. That “Superheavy” story arc is what inspired this obscenely giant BatBot Xtreme toy that will make you wish you were five-years old again. Available for pre-order on Amazon starting tomorrow, Fisher-Price’s new BatBot Xtreme is part of the company’s Imaginext brand which is essentially a line of miniature action figures designed to be safe and accessible for younger kids. But standing 28-inches tall, this towering mech is almost as big as the average toddler, so we’re not entirely sure how they’re going to be able to carry it to a playdate or show-and-tell at school without some sort of BatCrane accessory. 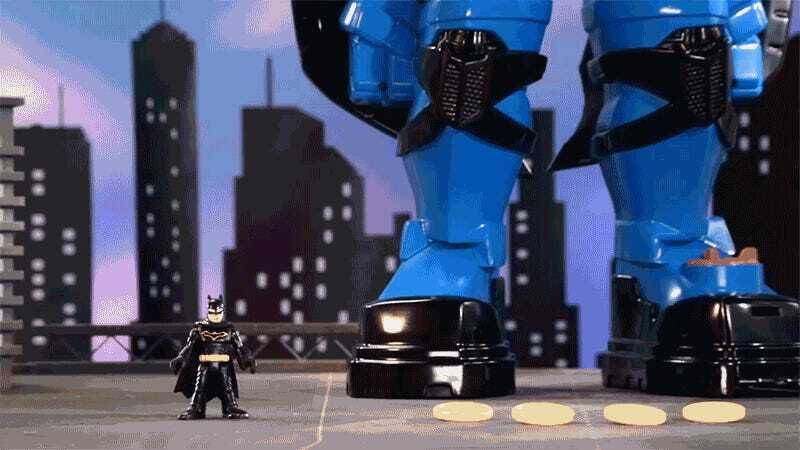 In addition to a voice changer and blasters that fire tiny foam disks at Batman’s foes, the BatBot Xtreme also features a set of pop-up wings that reveal an extra pair of extending fists that kids can use as a sort of Rock ‘em Sock ‘em Robots toy to smash things up; a popular pastime amongst five-year old kids. BatBot Xtreme’s chest also opens to reveal a playset with multiple levels, and the BatCycle comes shooting out of its foot should the Dark Knight need to beat a hasty retreat that’s just not possible while he’s piloting a giant city-smashing mech.